Join the SeniorCare family and try us out for the day—FREE! Our Adult Day Stay Service is offered at select SeniorCare homes in Overland Park and Leawood. For over a decade, we’ve provided professional Alzheimer’s care for up to 8 residents at each of our real neighborhood homes. This “daycare” style program gives families a break from caregiving and helps stretch resources by delaying full-time moves. Day Stay families use the time to recharge, run errands, enjoy grandkids or catch up on work. You can schedule days as needed throughout the month. Care is provided for up to 12 hours and includes three meals. Our team of Care Specialists and Nurses will care for your loved one as if they are a current full-time resident. Day Stay folks benefit from stimulation and the flow of a small home environment. 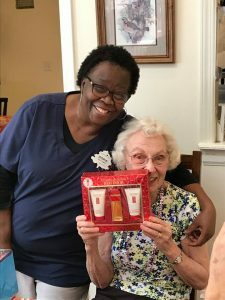 Our routines and activities provide the perfect amount of social stimulation yet put safety and personalized care at the center of each visit.